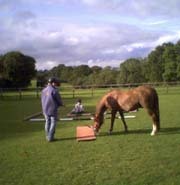 Thank you for visiting the Equine Mediator site. Zoe Chipman Dearing works with horses and their people to help achieve a close, sustainable relationship, to help iron out any blips that have occurred in that relationship, or to get you on the right track with a new horse. Some times, through no fault of the horse or the owner, things go wrong. This could be because the horse has been traumatized in the past, has been rushed in a certain part of his education at some point, or maybe he just hasn't had that education in the first place. Sometimes there are outside influences that are effecting the behaviours - for instance, pain must never be ruled out. All horses are individuals, and all humans are individuals. Therefore, all partnerships of horse and human are individual. 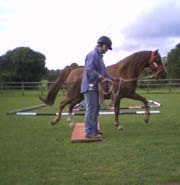 With this in mind, Zoe works at a pace that both the horse and the owner can easily follow. She never puts either of them out of their comfort zone to the point that they haven't a clue what's going on! 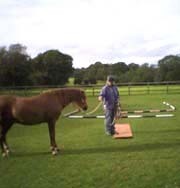 There is only one way to communicate effectively with horses, and that is, in fact, the same way that we communicate effectively with ALL animals - humans included. It revolves around consideration, compassion, fairness, empathy, being clear about what you require of that animal,and the sensitivity and determination to carry on. Zoe can help you achieve all of this.